In their journey, the reached an old temple- Piggie used his psychic power and converted the entire place into a beautiful abode. He even changed himself into a handsome man too. Tang Sanzang was not impressed. He told Piggie that ordained people should not crave for good abode and be happy with whatever found. He instructed Piggie to convert back the place back to its original form. Piggie reluctantly do so- he begged his teacher if he could remain the human look as his excuse is that he would scare people away with his pig face. His teacher said that the value of a person is in his heart, and not in his looks and instructed that he turn himself back to Piggie. Piggie was very miserable- he could not understand why his teacher had chosen to sleep in a dirty abandoned place and he could not have that good looks that he used to have. The problem would soon begin from here…. In the kingdom that they were currently at, there is an elderly king who tried to get his only daughter to be married. When the news went out that the daughter was to be married, princes and royalties from far and wide came. The princess was not impressed as she felt the suitors were of no good character. So, on the next day when she was supposed to choose a suitor, she ran away from the palace. In panic, the king instructed all the gates to be closed to prevent the princess from escaping. So, Tang Sanzang and his disciples, who had wanted to leave the place, could not do so and decided to wait till later. Half way through, Piggie developed a stomachache and asked the rest to go back first and he would follow suit once he settled his ‘business’. It was when he bumped into the princess, who was dressed like a normal person being bullied by some men. Of course he did not know she was a princess- he had just seen a beautiful girl and wanted to be a hero. The princess had fallen in love with him on first site. By the time the army catches up and apologized to the princess, he realised and was invited back into the palace. At first, greedy Piggie thought he was to receive monetary compensation and was excited. But the king said that he had intended to betrothe his only daughter to him. And he was to inherit the entire kingdom because the king’s only son went missing 5 years ago and there was no male heir (the missing son was in fact, the man who was kidnapped by Skeleton Spirit and now dead). He could not resist- but the first time, when he went back, his teacher’s concern touched his heart and he intended to go back to the princess to tell him that the marriage’s off. But instead, he found the princess actually missed him so much that she drew a picture of him. The pull of love was too strong to resist. Coupled with life of luxury and to be able to be a king- remember the earlier part where Piggie was so unhappy with the wretched conditions and wished things were better? Now he got it and he was not about to let it go. After some thinking- he hatched a plan. He forged his own death on the pretense of dying while trying to save his teacher’s life. He replaced his body with a body of a pig (because when an animal spirit dies, it would revert back to its original form). While his teacher was heartbroken, he was enjoying his life in the palace. When his teacher choose to get wet in the rain in order to protect the urn that was supposed to house his ashes, Piggie was inspecting the gifts of gold and treasures presented to him as the king had given him royal titles. However, regardless of where Tang Sanzang stopped, he had to get his travel document endorsed by the king (sort of like our passport in modern days). So he made the trip to the palace and met Piggie – and realised that in fact, Piggie had not died. 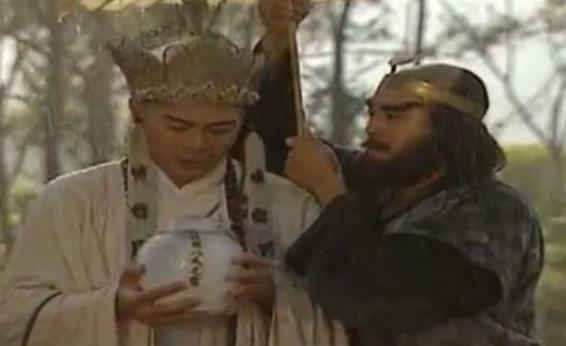 His teacher did try to persuade him to come back as Piggie had made a promise to Guan Yin. 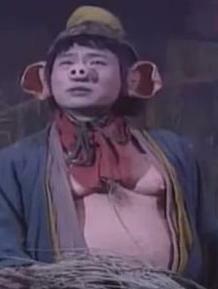 But Piggie refused to admit that it was him and told Tang Sanzang that he was mistaken. Piggie’s marriage to the princess was to be the next day.